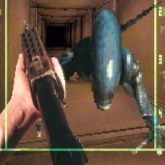 Description: Alien Vs Predator was Atari Jaguar's best first person shooter. You can choose from three characters to play as including the Alien, Predator or Marine. My personal favorite character is the Marine because he is armed with guns. Not only that his campaign is the funnest because you are fighting against aliens. Depending on the character you choose the enemies and gameplay will change. The levels are insane mazes that are fairly easy to navigate. For an older game the graphics still hold up fairly well today. Game Controls: Enter Key = Start Button. Arrow Keys = Move. "X" Key = Attack/Shoot. "C" Key = Open Doors.